"Climate change far worse than thought before"
Anybody can play the game, but only the realists can govern. The basic question is simple: Should health care be a basic right or is it a privilege for those who can afford it? Rush says it's a privilege -- pay or die -- and for his colonoscopy, they use a golden probe with a diamond tip, but most Americans agree that health care is basic, like education or decent roads or clean water. Holy Scripture would seem to point us in that direction. And yet the churches, so far as I can see, have chosen to stay aloof from this issue. Churches that feed the hungry and house the homeless dare not offend the conservatives in their midst by suggesting that we also tend the sick. And the opposition has beaten on garbage cans and whooped and yelled and alarmed the populace, which they're quite good at. These people look at a clear blue sky and see a conspiracy. Arousing alarm is easy, teaching is tough. It takes patience and discipline to teach; any bozo can drop a book on the floor and make people jump. This is true even in Massachusetts. And in Nevada, where Sen. Harry Reid is facing a tough challenge in the fall. Yesterday, I took the day off from work and skied at Snowmass with Nan, her brother Pat and Pat's son Aaron. Pat and Aaron were visiting from Wisconsin for a ski trip. 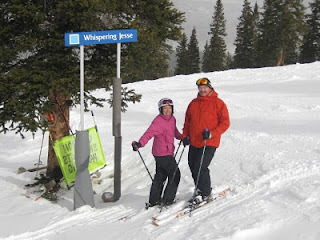 In a few quick days, they skied with Nan at Powderhorn, Aspen Highlands, Aspen Mountain and Snowmass. The conditions have not been great this season, but Pat and Aaron seemed happy just to be skiing bigger terrain than what is available in the Midwest. I don't know why I never thought of it before, but I don't have any photos of the ski run that shares its name with this blog, Whispering Jesse. Pat had his camera so I suggested that we swing by the run, which is located at the eastern edge of the Big Burn. It is one of my favorites, a rolling cruiser through glades of spruce trees. As I mentioned way back when, in "Where the name comes from", I'm sure Whispering Jesse the ski run influenced John Denver when he wrote his song of the same name. It definitely influenced me when I started this blog and chose a name for the sailboat I hope to own someday. Nan's birthday is today, but since today is a Monday, we celebrated over the weekend instead. Last year, we stayed in Grand Junction and went ice skating. I know, it would be hard to top that! Well, when I started looking for something fun to do, I discovered that the Denver Nuggets would be playing the Cleveland Cavaliers on Friday, January 8, at the Pepsi Center in Denver. I gritted my teeth and clicked the "Best Available" button on the tickets website. The tickets were expensive, but I figured, when would we ever get to see LeBron James and Shaquille O'Neal play again? We had good weather and light traffic for the drive to Denver. When we pulled up in front of the Hotel Monaco, the valet informed us that because we were driving a hybrid, the parking fee would be reduced by half. Nan mentioned at the front desk that we were there to celebrate her birthday, and the clerk upgraded us to a suite. And when I plugged in the laptop, I found out we belonged to the hotel's free Internet access program. We had dinner reservations at The Capital Grille before the game. We had never eaten there before, but we had heard only good reviews so we were eager to try it. They must have known it was Nan's birthday. The table was decorated for the occasion and there was a gift card for a free dessert. The food, wine and service were excellent. As we were finishing our dinners, one of the restaurant's partners, Charlie Sauter, came over and chatted with us like we were old friends. If he had been a dog person instead of a cat person, I would have offered to send him a copy of Raising Charlie. A little while later, while we were eating Nan's birthday dessert and sipping coffee, Charlie came back to tell us that a person who preferred to remain anonymous had picked up our dinner bill. We thought he was joking, but he took the bill from the table and walked away with it. We were so overjoyed that we slipped our server Sydney an extra tip and a hug as Charlie escorted us out of the restaurant. Feeling flush, we decided to take a bicycle rickshaw to the Pepsi Center. Our driver Chris wove deftly in and out of traffic while Nan and I sat in the back, awed and laughing at his fearlessness. He dropped us right at the door, and we rode the escalators up to our seats. As you can see from the photo, they weren't too bad. That's LeBron at the free throw line and Shaq back at the center line. 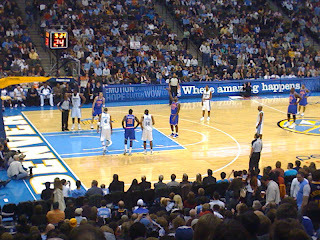 The Nuggets played extremely well, despite missing Carmelo Anthony from their line-up, and squeaked out a 99-97 victory in the closing seconds. It certainly was a charmed day for Nan's big celebration. When I told a friend about it today, he said she should have bought a lottery ticket! Global carbon dioxide emissions from fossil fuels in 2008 were 40 percent higher than in 1990. The recent Copenhagen Accord said warming should be contained within two degrees, but every year of delayed action increases the chances of exceeding the two-degree warming mark. Carbon dioxide is the main greenhouse gas (GHG) warming the atmosphere. To keep within the two-degree limit, global GHG emissions need to peak between 2015 and 2020 and then decline rapidly. To stabilise climate, near-zero emissions of carbon dioxide and other long-lived GHG should be reached well within this century. More specifically, the average annual per-capita emissions will have to shrink to well under one tonne carbon dioxide by 2050. This is 80-95 percent below the per-capita emissions in developed nations in 2000. The studies show extreme hot temperature events have increased, extreme cold temperature events have decreased, heavy rain or snow has become heavier, while there has been increase in drought as well. They also show that the intensity of cyclones has increased in the past three decades in line with rising tropical ocean temperatures. Satellites show recent global average sea level rise (3.4 mm/year over the past 15 years) to be about 80 percent above IPCC predictions. This acceleration is consistent with a doubling in contribution from melting of glaciers, ice caps, and the Greenland and West-Antarctic ice sheets. New estimates of ocean heat uptake are 50 percent higher than previous calculations. Global ocean surface temperature reached the warmest ever recorded in June, July and August 2009. Ocean acidification and ocean de-oxygenation due to global warming have been identified as potentially devastating for large parts of the marine ecosystem. By 2100, global sea level is likely to rise at least twice as much as projected by the IPCC in 2007; if emissions are unmitigated the rise may well exceed one metre. The sea level will continue to rise for centuries after global temperatures have been stabilised, and several metres of sea level rise must be expected over the next few centuries. A wide array of satellite and ice measurements demonstrate that both the Greenland and Antarctic ice sheets are melting at an increasing rate. Melting of glaciers and ice-caps in other parts of the world has also accelerated since 1990. The contribution of glaciers and ice-caps to global sea level rise has increased from 0.8 mm per year in the 1990s to 1.2 mm per year today. The adjustment of glaciers and ice caps to present climate alone is expected to raise sea level by about 18 cm. Under warming conditions they may contribute as much as around 55 cm by 2100. The net loss of ice from the Greenland ice sheet has accelerated since the mid-1990s and is now contributing 0.7 mm per year to sea level rise due to both increased melting and accelerated ice flow. Antarctica is also losing ice mass at an increasing rate, mostly from the West Antarctic ice sheet due to increased ice flow. Antarctica is currently contributing to sea level rise at a rate nearly equal to Greenland. I hope to live until about 2050. Based on the IPCC findings, the world will be a far less hospitable place by then. The recommended steps to prevent human-caused climate change, like reducing per capita GHG emissions by 80-95 percent of 2000 levels, are not feasible. Global population will continue to increase, developing nations will continue to build new power plants, and developed nations will continue to rely on fossil fuels. 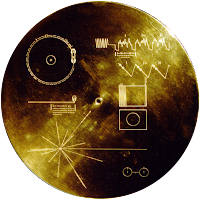 Like many science-minded people, I'm hoping for some kind of fix or breakthrough, but I'm afraid it's a false hope. I think we're facing an inevitable decline in the quality of life for all of earth's inhabitants, at least for those who survive extinction. This is the only place to be.